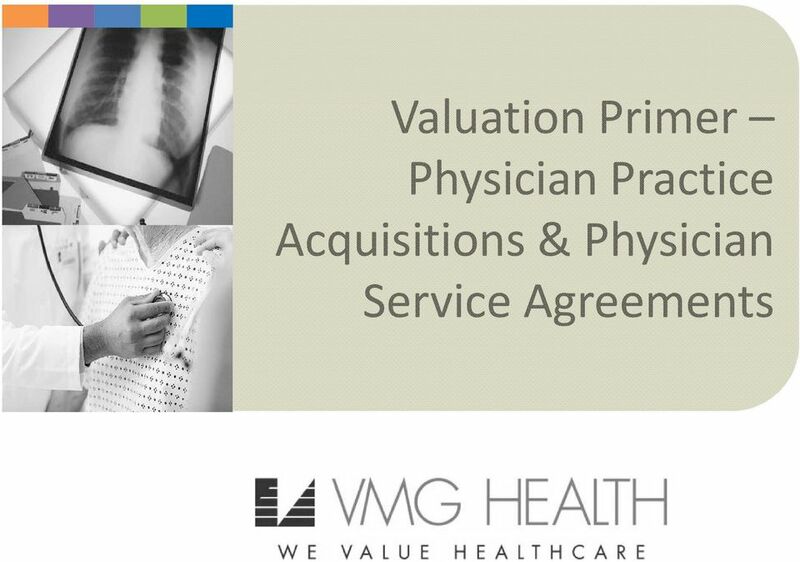 Download "Valuation Primer Physician Practice Acquisitions & Physician Service Agreements"
25 Valuation Primer The Asset (Cost) Approach Takes into consideration the cost of replicating a comparable asset, security or service with the same level of utility. Typically used when the entity has historical losses or nominal projected cash flow. 27 Valuation Primer The Market Approach Estimates value by comparing the value of similar assets, securities or services traded in a free and open market to the subject asset, security or service. Similar publicly traded companies are not comparable from a size or growth standpoint and often include practices with a variety of management services agreements. Similar transaction information in the public domain is rarely useful because details on transaction structure (including post transaction compensation and employment terms) are not included. 31 Physician Service Agreements (PSAs) May be a result of joint ventures, acquisitions, employment or independent contractor arrangements Traditional Employment Physician Lease Model Administrative Services Call Coverage Clinical Co management (fixed + variable) Management Professional/technical splits Development Billing and Collection Leasing Arrangements All of the above combined Often a combination of several valuations is required for one agreement. Choose the right data / analysis to reflect each of the services. 32 PSA Valuation Basics Select a valuation expert with care does the valuation expert have: Credentials from recognized organizations (AICPA, ASA, NACVA)? Experience with healthcare industry regulations and guidance? Expertise on the impact of the regulations on a valuation? Knowledge of relevant market survey data and its limitations? There are no published standards for valuing physician services and compensation. Stark law indicates that fair market value is based on the facts and circumstances and reasonable methodologies should be used. 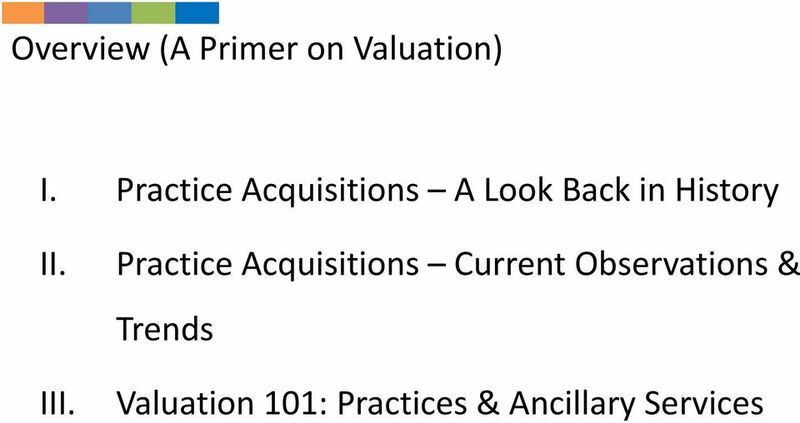 Most valuators start with traditional business valuation approaches (Cost, Market, and Income Approaches) The PSA terms must be understood prior to valuation: What services will be provided? How will the parties be compensated? The valuation should match the agreement. 34 Common Misconceptions of FMV Compensation data point from a single survey constitutes FMV. Per Stark, reference to multiple, objective survey remains a prudent practice in evaluating FMV. One survey alone may not provide enough support for FMV compensation. Any compensation rate that falls below a certain percentile (i.e., median or 75 th ) is FMV. Median means that 50% of respondents earned less than this amount. May raise a red flag if productivity is not considered (i.e., paid 60 th percentile while productivity falls at 40 th percentile). 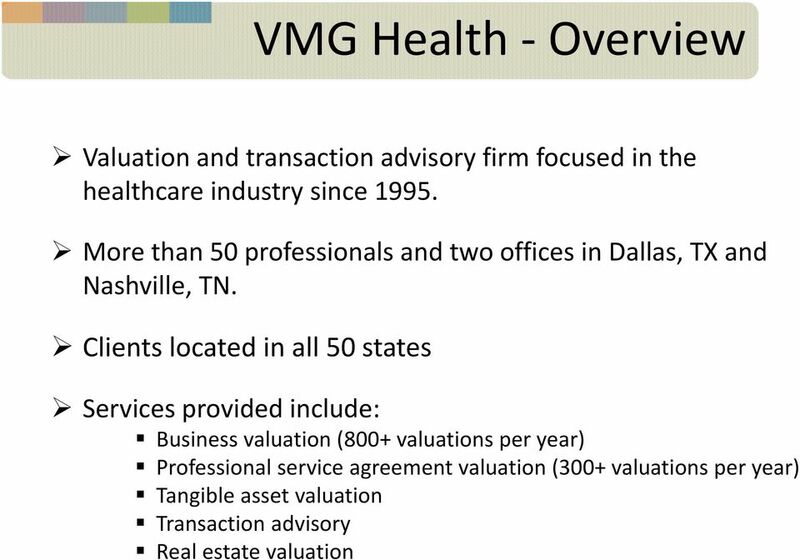 Compensation offers from local competing hospitals determine FMV. Compensation offer may not be arms length or consistent with FMV. 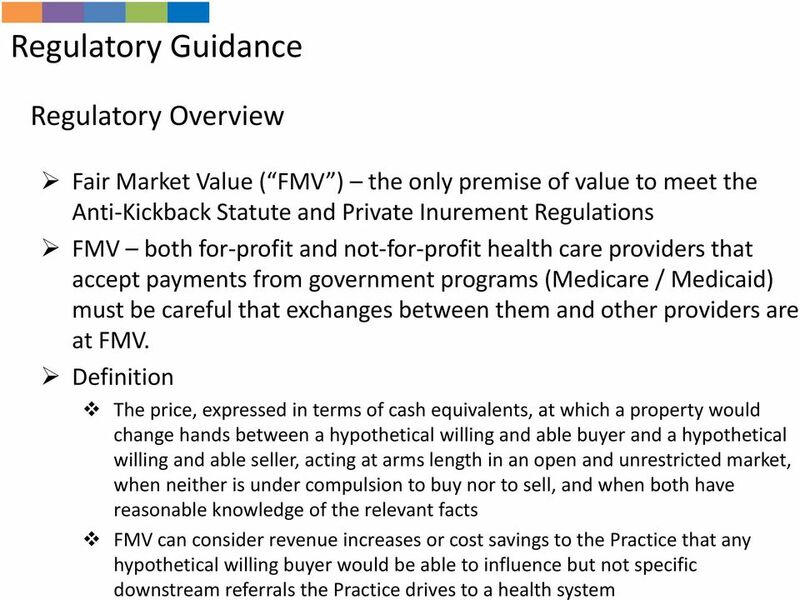 Per Stark, market data utilized in determining FMV should exclude referral relationships. Takeaway: Each of the above may be considered as part of the entire FMV analysis, but should not be the sole basis for FMV. 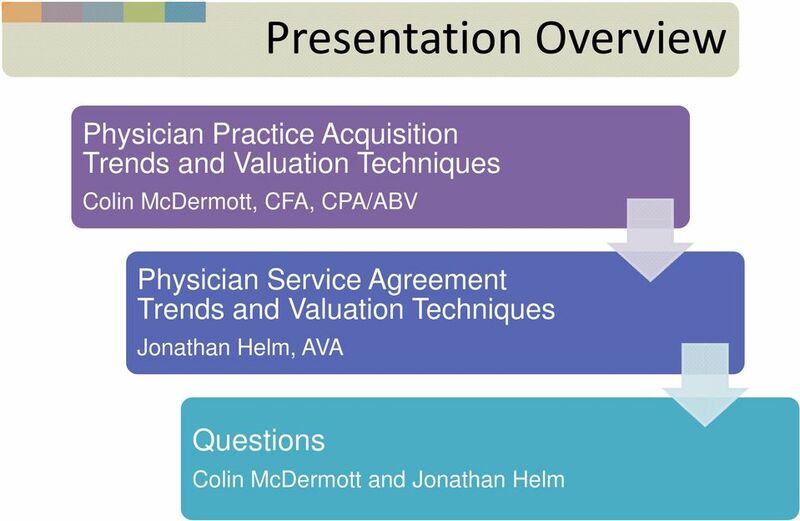 36 Clinical Services Valuation Cost and Market Approaches (blended Cost Market Approach): Cost to employ/contract with a physician based on market data Most commonly utilized method among valuators Simple to understand Benchmarking analysis that aligns compensation and productivity Compensation and productivity data are obtained from independent, published surveys: MGMA Physician Compensation and Production Survey AMGA Medical Group Compensation and Financial Survey SCA Physician Compensation and Productivity Survey Common productivity metrics include: Work RVUs Total RVUs Professional collections Gross charges Patient encounters Note: MGMA = Medical Group Management Association, AMGA = American Medical Group Association, and SCA = Sullivan, Cotter and Associates, Inc.
37 Clinical Services Valuation Benchmarking example (using the MGMA survey): Solo practitioner specialized in general orthopedic surgery No in office ancillaries or mid level providers 2011 annual work RVU volume of 13,867 MGMA Physician Compensation and Production Survey Physician Work RVUs 25th Median 75th 90th Orthopedic Surgery: General 6,239 8,250 11,021 13,867 Subject Physician's Annual Work RVUs 13,867 Conclusion: Physician productivity falls at the 90th percentile Physician Compensation 25th Median 75th 90th Orthopedic Surgery: General $372,437 $497,088 $658,842 $825,044 Selected Compensation (based on work RVUs) $825,044 Takeaway: Valuators commonly benchmark multiple productivity metrics to multiple surveys. 38 Clinical Services Valuation Common benchmarking mistakes include: Including mid level provider productivity Benchmarking total RVUs to reported work RVUs Benchmarking total collections to reported professional collections Miscalculation of patient encounters (read the data definition of each survey!) Common misunderstandings of survey data: Reported compensation is a definitive snapshot of current market compensation Reported compensation reflects only clinical services Common mistakes in using the reported compensation per work RVU: Per MGMA, an inverse relationship exists between work RVU volume and compensation per work RVU Paying a highly productive physician the 75 th to 90 th percentile compensation per work RVU may result in compensation outside of FMV. See illustration on the following page. 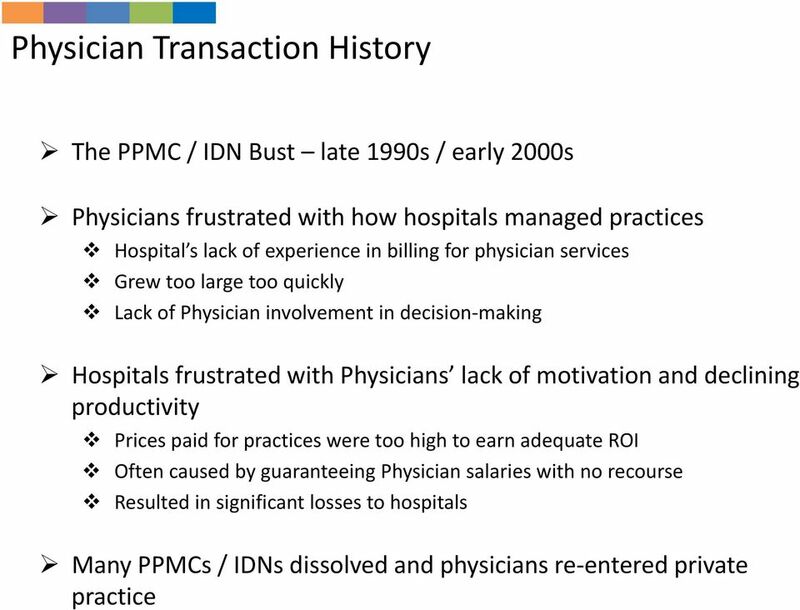 39 Clinical Services Valuation Misuse of reported compensation per work RVU data Solo practitioner specialized in general orthopedic surgery No in office ancillaries or mid level providers 2011 annual work RVU volume of 13,867 Hospital employer proposed MGMA 90 th percentile compensation per work RVU MGMA Physician Compensation and Production Survey Compensation per Work RVU 25th Median 75th 90th Compensation per work RVU - Orthopedic Surgery: General $47.74 $60.39 $77.39 $95.48 Times: Physician's Annual Work RVU Volume (equal to MGMA 90th) 13,867 Equals: Annual Physician Compensation $1,324,021 Physician Compensation 25th Median 75th 90th Total Compensation - Orthopedic Surgery: General $372,437 $497,088 $658,842 $825,044 Annual Physician Compensation is more than 160% of the 90th percentile!!! $1,324,021 Takeaway: Always test productivity models to ensure the selected metric and expected productivity result in FMV compensation. 40 Clinical Services Valuation Income Approach: Another standard valuation approach Considers normalized historical compensation Considers normalized physician practice revenues less expenses and a reasonable rate of return to the employer. 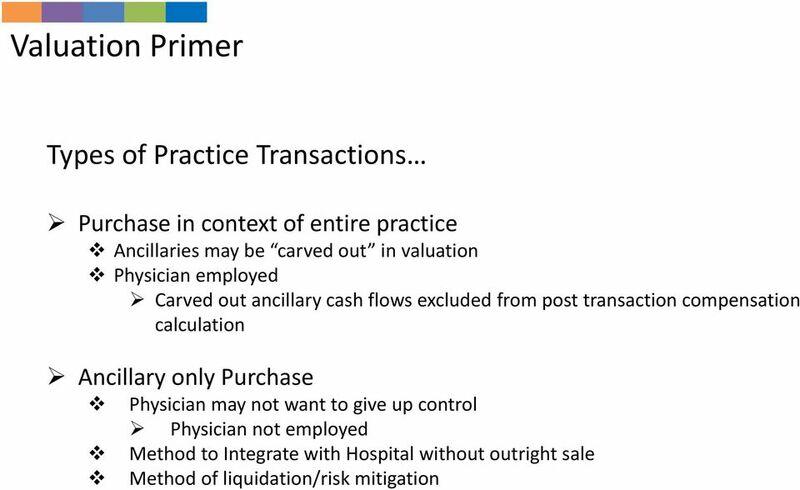 Considers specific economic factors of a physician s practice such as: o Local reimbursement o Payor mix o Procedure mix o Practice expense profile Takeaway: The Income Approach often serves as a reasonableness check to the results of the Cost Market Approach. 41 Call Coverage Services Overview Historically, physicians provided call coverage to Hospital emergency departments on an uncompensated basis. Sometimes a condition of medical staff membership Sometimes granting/renewal of clinical privileges Not anymore.... Why not? Increasing number of uninsured patients Aging active physician staff Increasing cost of malpractice insurance and declining reimbursement Perceived increase in risk of lawsuits According to the Sullivan, Cotter and Associates Call Coverage Survey: 63% of survey respondents had difficulty finding physicians to provide call 7% had to shut down one of more services due to lack of call coverage 58% employ physicians specifically to provide call coverage Most common payment structure is an hourly rate or stipend First question to ask prior to valuation: Are call coverage services generally needed for the subject specialty? 42 Call Coverage Services Valuation As noted previously, no published standards exist for valuing call coverage services. Regulatory guidance OIG Advisory Opinion no Issued on September 20, 2007 OIG agreed not to prosecute a hospital for paying for call coverage services OIG found the arrangement to be at low risk for fraud and abuse and noted the following: o Independent analysis was conducted to ensure compensation was FMV o The per diem rate was designed to compensate based on the burden of call o On call physicians were obligated to provide care to ED patients regardless of the patient s ability to pay o Physicians in each specialty received the same per diem rate o The medical center had a legitimate need for the coverage services Takeaway: The development of a reasonable and FMV rate for call coverage services must consider the specific burden of call. 43 Call Coverage Services Valuation Cost Approach Beeper Rate Method: Determines call compensation as a percentage of base compensation Base compensation rates are based on multiple, published surveys: o MGMA Physician Compensation and Production Survey o AMGA Medical Group Compensation and Financial Survey o SCA Physician Compensation and Productivity Survey Percentage of base ranges (or beeper rates) are based on market observations and call coverage pay rates of non referring physicians Base rate may need to be adjusted for independent contractor relationship Factors to consider in determining a Beeper Rate: Volume of call o Phone calls o In person Response time requirements Ability to bill/collect Payor mix of patients served Restricted versus unrestricted coverage Note: MGMA = Medical Group Management Association, AMGA = American Medical Group Association, and SCA = Sullivan, Cotter and Associates, Inc.
44 Call Coverage Services Valuation Market Approach: Considers available market survey data for call coverage services Currently, there are two prevalent market surveys: o MGMA Medical Directorship and On Call Compensation Survey o SCA Physician On Call Pay Survey Compensation data within the surveys is reported as an hourly rate or daily stipend Limitations of the survey data: Based on referral relationships (physician hospital) Limited number of respondents Can be large variances in the fees reported Important factors such as call volume payor mix are unknown Details such as whether the physician bills/collects are unknown Takeaway: The shortfalls of the Market Approach often limit its use to a reasonableness check to the results of the Cost Approach. 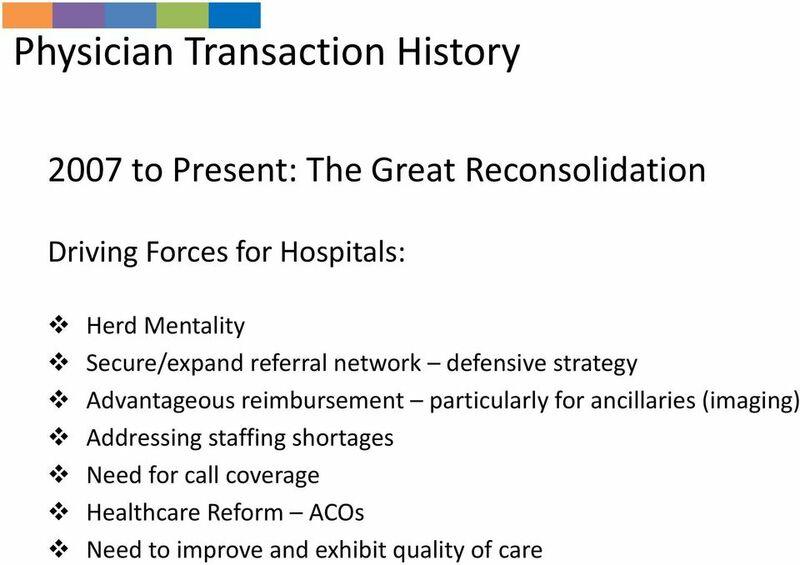 Note: MGMA = Medical Group Management Association and SCA = Sullivan, Cotter and Associates, Inc.
45 Medical Director Services Overview As with call coverage, historically it was not unusual for physicians to volunteer their time to hospitals for medical director duties. 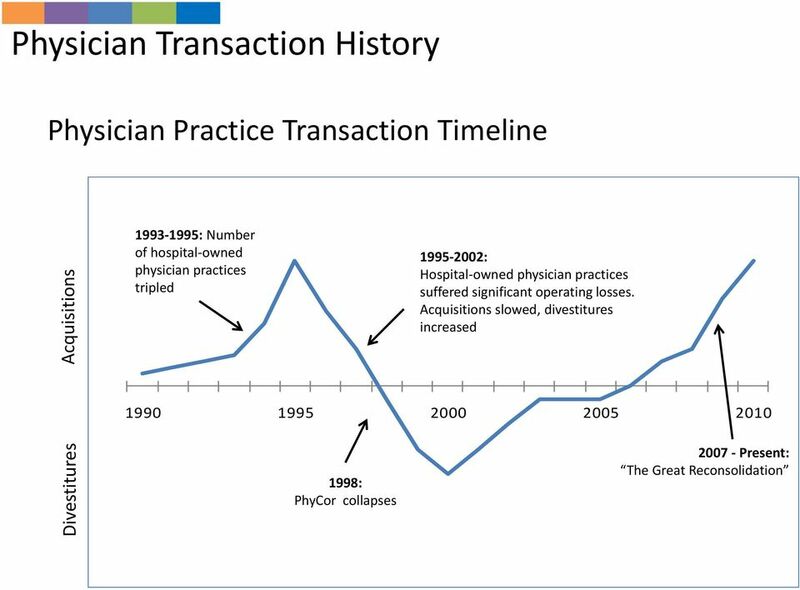 Due to the increase in duties and demand of services, physicians require reasonable payment for their time and services. According to Integrated Healthcare Strategies Medical Director Survey, medical directors common provide the following services: Act as a liaison between the medical staff and hospital management Participate in the JCAHO accreditation process Physician credentialing and peer review Utilization review and quality improvement Establish and implement clinical pathways New program development and implementation Preliminary questions to ask prior to valuation: Are the services needed (i.e., how many hours? How many other directors?)? Do the services require a physician? A specific specialty? 46 Medical Director Services Valuation Two valuation approaches: Cost Approach Market Approach Results are typically stated as an hourly rate Cost Approach Considers the cost of the physician s time based on clinical compensation Considers multiple, published compensation surveys: o MGMA Physician Compensation and Production Survey o AMGA Medical Group Compensation and Financial Survey o SCA Physician Compensation and Productivity Survey Annual hours set at 2,000 based on Stark guidance Limitations of the Cost Approach Compensation does not match the services provided Stark indicates that clinical compensation may not be FMV for administrative services Takeaway: Limited reliance is usually placed on the Cost Approach. Note: MGMA = Medical Group Management Association, AMGA = American Medical Group Association, and SCA = Sullivan, Cotter and Associates, Inc.
47 Medical Director Services Valuation Market Approach Considers compensation data for similar services Considers multiple, published medical director compensation surveys: o IHS Medical Director Survey o MGMA Medical Directorship and On Call Compensation Survey o SCA Physician Compensation and Productivity Survey Annual hours set at 2,000 based on Stark guidance Limitations of the Market Approach Limited number of respondents Some conservative parties argue the data is tainted with referral relationships Other Considerations Productivity data is not applicable to medical director survey data Percentiles above the median are often selected based on qualitative factors Takeaway: The Market Approach matches compensation and services and is generally relied upon to determine FMV medical director compensation. Note: MGMA = Medical Group Management Association, IHS = Integrated Healthcare Strategies, and SCA = Sullivan, Cotter and Associates, Inc.
51 Co Management (Quality) Overview OIG & CMS guidelines provide a solid foundation regarding structuring quality care arrangements: Quality measures should be clearly and separately identified. Quality measures should utilize an objective methodology verifiable by credible medical evidence. Quality measures should be reasonably related to the hospital s practice and consider patient population. Do not consider the value or volume of referrals. Consider an incentive program offered to all applicable providers. Incentive payments should consider the hospital s historical baseline data and target levels developed by national benchmarks. Thresholds should exist where no payment will accrue and should be updated annually based on new baseline data. Hospitals should monitor the incentive program to protect against the increase in patient fees and the reduction in patient care. Incentive payments should be set at FMV. 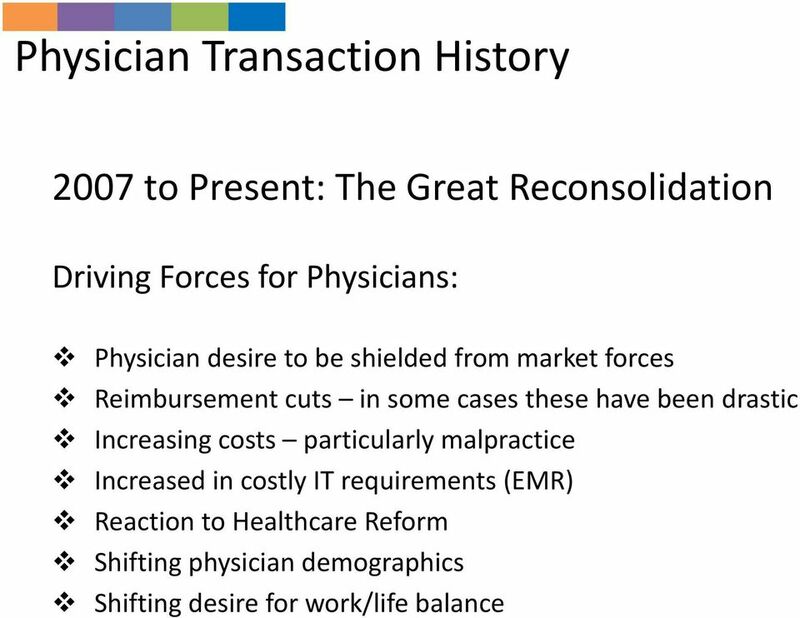 53 Final Thoughts Many PSAs include multiple physician services this has become known as stacking. Ensure that each stacked service is consistent with FMV Ensure that the total package of services is reasonable o Are the services required by the hospital / facility? o Can the physician reasonably provide all services included in the PSA (i.e., will the physician be working 90 hours per week?)? Increasing trend in use of internal compensation calculators Great tool for call coverage and administrative services Internal calculators are based on systematic and unbiased overall guidelines which eliminate the user s ability to include its results o Each indication of value considers the specialty and reflects the service provided by the physician. o Utilizes multiple, objective national surveys reflecting compensation data by specialty. o Each indication delineates between employed and independent contractor agreements. 54 Colin McDermott, CFA, CPA/ABV Senior Manager Jonathan Helm, AVA Manager Questions? Commercially Reasonable - Whose Responsibility is it? 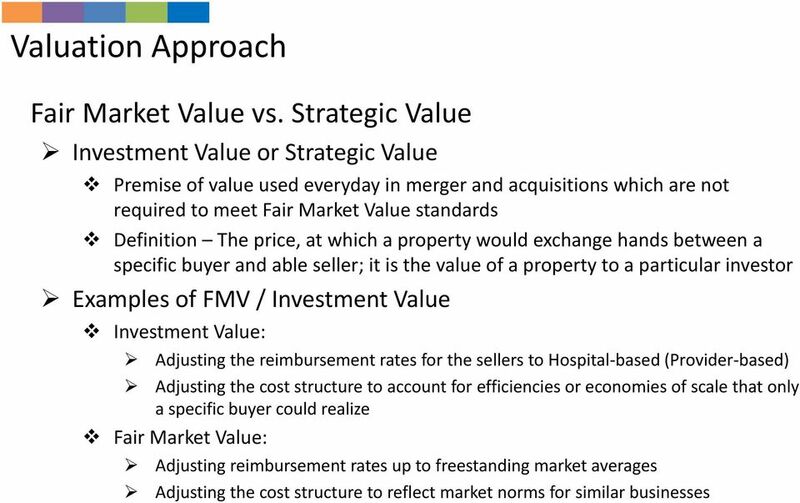 Demystifying Fair Market Value Compensation What Do You Need to Know? 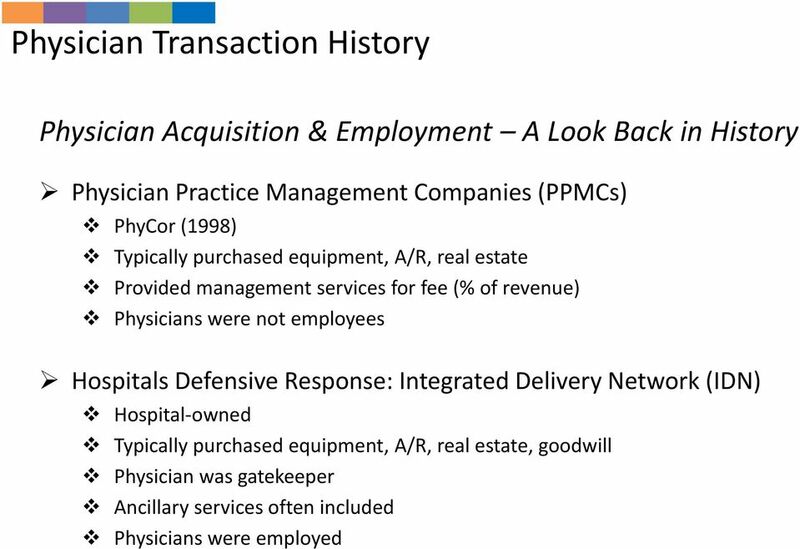 Fair Market Value Issues in Physician Practice Acquisition and Employment Deals by Health Systems. Timothy Smith, CPA/ABV Mark O. To Be or Not To Be Independent, That Is The Question. Lisa Chase Law Offices of Lisa Chase, P.C. chase@lchaselaw. Financial Modeling & Valuation Stuart A. Neiberg, MAcc, CPA, CFA Director HealthCare Appraisers, Inc.
KATHLEEN L. DEBRUHL & ASSOCIATES, L.L.C. 614 TCHOUPITOULAS STREET NEW ORLEANS, LOUISIANA 70130 504.522.4054 (OFFICE) 504.522.9049 (FAX) WWW.MD-LAW. Hot Fraud and Abuse Issues for Ambulatory Surgery Centers: An Advanced Interactive Discussion This webinar is brought to you by the Fraud and Abuse (Fraud) Practice Group. February 1, 2013 1:00-2:30 p.m.
Fair Market Value and Payments to Healthcare Professionals How Should We Determine What We Pay? Huron Consulting Services LLC. All rights reserved. Society for Radiation Oncology Administrators. Cancer Program Physician Employment Arrangements: What You Should Know! 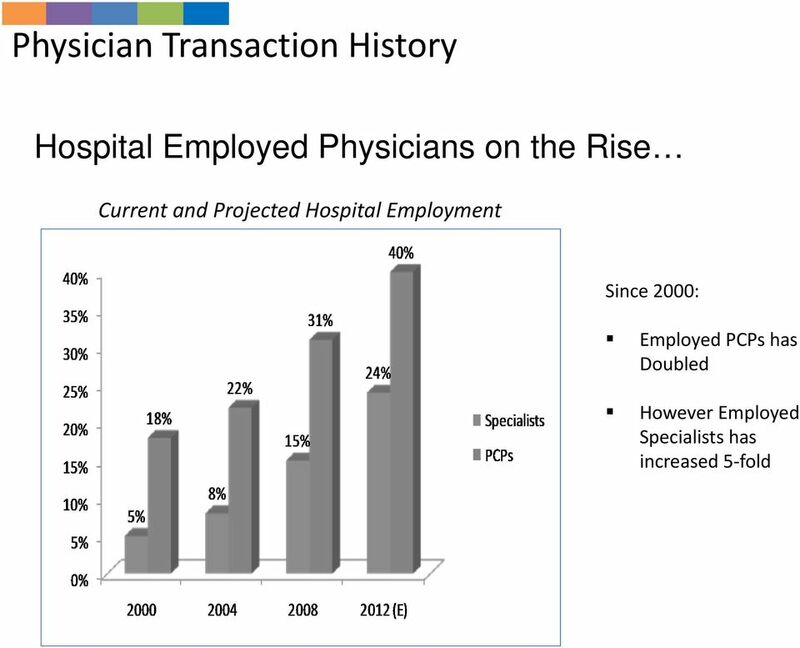 » The most common residency program for current members was PSR-12 (37%).» 5% completed PM&S programs in 2005 and 2007. ASC Valuation Survey. How do the ASC companies assess value? 14 ASC Valuation Survey How do the ASC companies assess value? 14 ASC Valuation Survey Results Executive Summary We are pleased to announce the results of HealthCare Appraisers 14 ASC Valuation Survey. 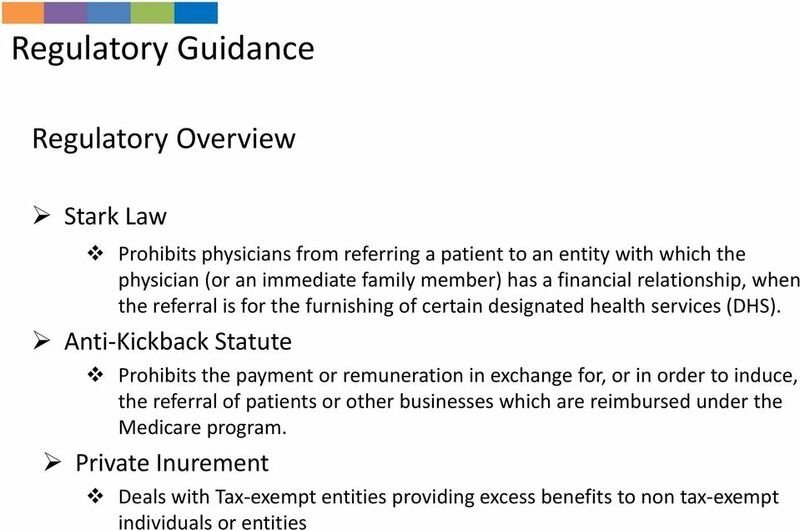 2013 Instructions for Schedule H (Form 990) Hospitals Department of the Treasury Internal Revenue Service Contents Page Future Developments...1 Purpose of Schedule...1 Specific Instructions...2 Part I. What Is FMV/Commercial Reasonableness? Why Should I Care?